Universal Box Brooder - It has a clear plastic front panel that allows easy viewing of the interior. 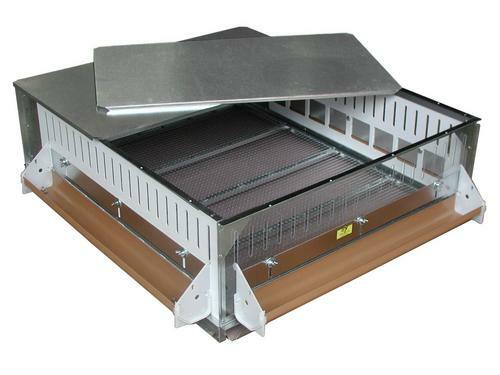 Each brooder comes with 3 28.5" troughs for feed or water mounted on outside of brooder. The 250 watt heater provides heat while the vented plastic side panels keep out drafts. It has a socket for an included, low wattage attraction bulb (3G24 Blue Bulbs). Each comes with a thermometer and wafer thermostat, which is accurate to 1 degree. The floor is ??" mesh which allows droppings to pass through. For quail or small chicks use the DACB paper for 4 to 7 days. Drop pans are made of lightweight aluminum and can be pulled out even when brooders are stacked and the wire floor is heavy with birds. This box brooder is universal as each side panel comes with adjustable gate to regulate openings for chick type and age to allow them access to feed and water. For the first 3 weeks quail chicks should use the 4YQW waterer and the 4GGF1 feeder. Day-old poultry and ducks can feed directly from the troughs. All 3 side panels and back door are easily removed for cleaning while the brooder is assembled. (TEMPERATURE RANGE IS 75 – 115 degrees, must be located in a heated space to maintain these temperatures.) Capacity to 4th week 100 quail - 50 Chukar or Pheasants - 48 chickens (these capacities vary with breed and size). Shipped in 2 cartons. Overall dimensions 32”w X 38”d X 12”h. 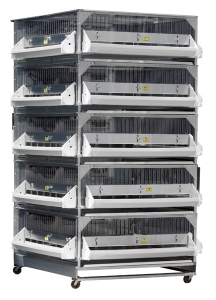 5 Tier Battery Brooder - battery brooders with clear panels are ideal for displaying all types of chicks in feed stores, to monitor chick conditions at a glance and to raise large numbers of birds in limited floor space. Lightweight materials mean lower shipping costs as well as easy handling of drop pans. Sturdy base with rugged casters and securely fastened brooders result in a solid stack which is movable when full of birds. Only 65” high, all tiers of 5 brooders are accessible and drop pans and floors can be removed for cleaning while the brooders are stacked. Can the Start @Grow unit be used for turkeys in lesser numbers? It wouldnt be recommended. Turkeys grow rather quickly and will run out of room even in limited numbers.